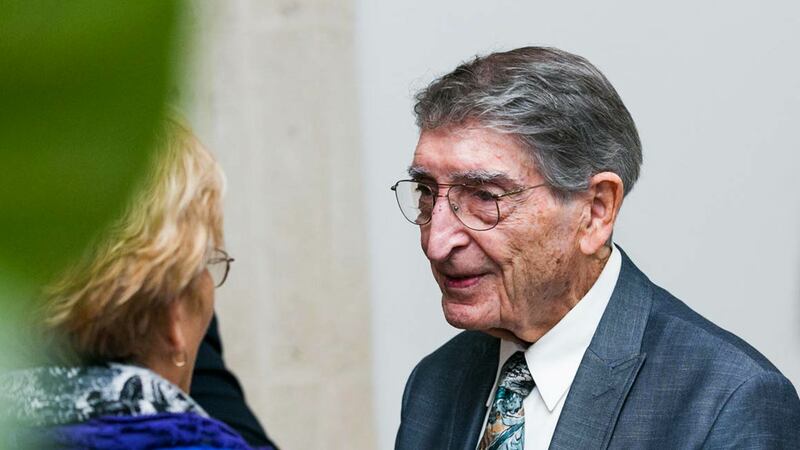 Bryant University in January recognized Victor W. Primavera, Jr. '49, P'81 as a successful graduate, faithful supporter, and true partner in the University's mission. Bryant presented a special Champions for Philanthropy award January 19 to a special University benefactor. Victor W. Primavera, Jr. '49, P'81 embodies the American success story. A first-generation American and the first in his family to attend college, Victor's accomplishments attest to the unique combination of determination, business savvy, and genuine kindness that has marked his life. Victor's parents were Italian immigrants who met in the United States and married while very young. In 1934, his father founded Danecraft, a sterling silver jewelry design and manufacturing company in Providence, RI. Victor’s Bryant education informed the way he managed the business as CEO and enabled the family business to thrive for more than seven decades. "I’m kind of proud of that," he modestly observes, while noting that many of the company's contemporaries are no longer in business. Upon his retirement, Victor's children Gail Primavera Gesmondi and Victor Primavera III '81 co-managed Danecraft. Today, Victor III is the company's CEO. Bryant alumnus Robert Soltys '81 is president. Victor's bond to Bryant has remained strong, demonstrated by a record of continuous giving since the 1960s. His foresight and generosity have provided scholarship assistance to scores of Bryant students since the establishment of the Primavera Endowed Scholarship Fund in 1988. A member of the Bryant Leadership Council of Donors, he was honored at the Jubilee Club dedication in 1989 with the naming of a campus classroom in his honor. The Palm Beach Gardens, FL resident also takes pride in Bryant’s success and its ascent to a leading position in American higher education. "I'm very proud of the fact that Bryant grew from a college to a university," he says, acknowledging the exceptional leadership of President Ronald K. Machtley. And he is delighted to see the Dean's List ranking of the students who benefit from the family-named scholarship. Victor can't precisely name what has motivated his ongoing support of Bryant, but admits, "I am a determined person. Once I start something, I continue with it." That legacy of determination has been an inspiring model for his family and colleagues, and a source of welcome assistance to the Bryant students who have and will benefit from his generosity. Bryant University is honored to recognize Victor W. Primavera, Jr. as a successful graduate, faithful supporter, and true partner in our mission – a Philanthropy Champion worthy of our deepest gratitude.